Kids who spend more time outdoors are less likely to be near-sighted, as I noted in a recent post. But it isn’t because they’re spending less time staring at books or computer screens, as I speculated might be the case. In fact, neuroscientist Sandra Aamodt, whose book I referred to in the previous post, explained in a comment that among children who spend the same amount of time outdoors, how much they read or work on a computer (“near work”) has no correlation with near-sightedness. In addition, in lab animals, dim light leads to near-sightedness and bright light normalizes sight by affecting eye growth, she said. So the bottom line remains the same: Spending time outdoors in childhood is associated with better eyesight. 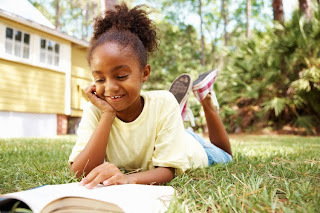 But kids don’t have to be hiking or looking over long vistas to get the benefit; they could be reading in the back yard. Of course there are many benefits to being physically active while outdoors, but apparently better eyesight isn’t one of them. - Read “The Sun is the Best Optometrist,” a New York Times op-ed on this topic by Aamodt and Sam Wang.